Paige Dansinger is an artist living in Minneapolis, Minnesota. We first met Paige at the 2012 Museum Computer Network conference in Seattle. Since meeting Paige we have been following her #DrawArt project which attempts to create a new understanding of art in a context that is both online and accessible by many. At Cooper-Hewitt we are always looking for ways to make our collection more accessible and so we were really pleased when Paige started to draw our Object of the Day series. So we were really excited when Paige started to draw our Object of the Day series. I have been drawing the Object of the Day from Smithsonian's Cooper-Hewitt Design Museum. Inspired by National Museum Month, I dedicated the month of May to drawing the collection that was presented daily on their new multi award-winning Public Alpha website. This Spring, I visited New York City to experience seeing my art in a museum for the first time. I had made 200 Digital Trading Cards for the Gutai Card Box included in the past exhibit, Gutai: Splendid Playground at the Guggenheim. Luckily, I was welcome to stay with my relatives in the Upper East Side. As often as I could, I'd walk over to the Guggenheim to see the exhibit and then on to the nearby Met, so I may draw their collection in a #DrawArt Digital Sketchbook. I loved my adventure in NYC so much I returned a couple weeks later with my son to show him where we should live one day! On my way back and forth between the apartment and the museums, I'd walk past the Cooper-Hewitt Museum. Closed for renovation, it was wrapped in plastic sheeting with metal girders covering the facade. Along with fine art, I always had a fascination with objects of material culture. It's likely a result of the opening scene in the first Indiana Jones movie (so GenX) that ignited a life dedicated to museums, cultural heritage and online collections – as well as my imagination & sense of adventure. I wondered about what it looked like inside – what was in there? I wanted to know the architectural and interior details of the site and galleries, it's objects for exhibition, and most of all, the contents organized in main storage. My experience an intern/volunteer assisting the Main Registrar of Collections, from 2005-2012, at The Minneapolis Institute of Arts inspired a deep interest in learning the contents of museum's collections. This interest contributed to my dedication in drawing over 1000 works of famous art from museums digitally on my iPhone & iPad and sharing them with Social Media. 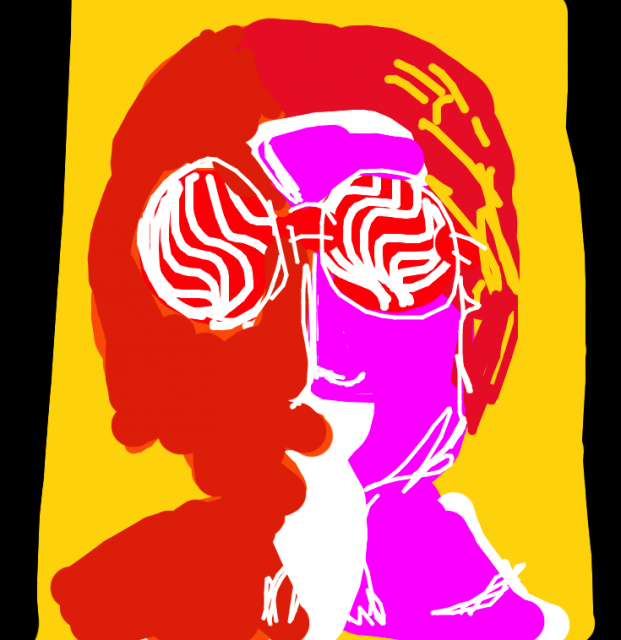 Using #DrawArt, I have also recently performed two one-day Digital Art Residencies. Cooper-Hewitt's mysterious exterior under-construction and the fact that it was closed to the public, completely inaccessible to me heightened my curiosity. How could I get inside and access the treasures in their collection? It would occupy my thoughts as I passed by. I wondered about the museum collection's vases, chairs and wall sconces. I wanted to know about their silver, plates, fans, and wallpapers. I could feel my inner-Indiana Jones was coming out.. I was on a quest and had to know more about the contents of the collection. As I walked by the museum, like a modern-day Indie, I whipped out my iPhone and checked-out their website. 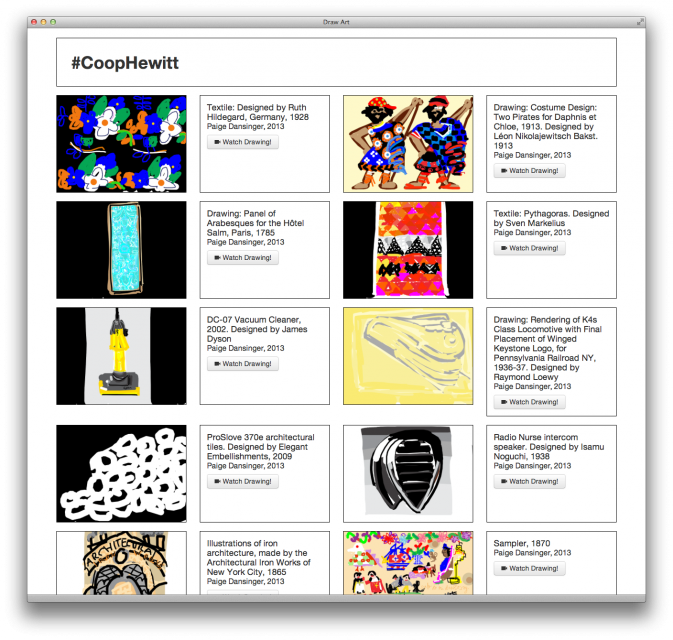 Cooper-Hewitt's new website gave me exactly what I needed. It let me know just what was up – right away. It shared that even though they are closed, there's still many things happening at programs in other local spots and it offered me three easy opportunities for engagement. Intellectually, I may learn more by reading about the Object of the Day, physically I may integrate good design in my life by shopping in their online store, and spiritually or holistically by becoming a member of the museum community. In my opinion, these forms of engagement are good examples of sustainable ways to make most people interested in this museum and to return to their website. When I read about their objects in the collection I was able to learn insights about the works that are more relevant today, in a language that was a mix of profesional museum voice, hip best friend with a twist of street vernacular – it a voice that anyone could identify with. I even had the option to see the collection organized by color – like shoes or color-coated candy. With the site easily organized and communicated in a language I understand, I wanted to return and learn more. For me, it was a return I made every day this month. I have accomplished my goal of drawing the Object of the Day for the month of May. In the middle of June, I will have another opportunity to get my Indiana Jones-on during a 3-week tour in Israel. My plan is to use #DrawArt to illustrate significant archeological sites and historic art and objects and to create an Indiana Jones-style illustrated story and game experience with the images I draw. I will likely continue to draw works from the collection at the Cooper-Hewitt until I leave for my new adventure and anticipate continuing drawing from the collection when I return later this Summer. When the museum reopens in 2014 I will come back to New York again. Hopefully I may be a Visiting Artist and use #DrawArt live in the museum!